BitCoin is a 'crypto currency'. Basically a currency that is not tied to anything tangible like gold, or the economy of a country. BitCoin, like all currency's, can be exchanged for goods or services. That means you can also use it for betting. Unfortunately the sites that will accept BitCoin for deposits are few and far between, and in the most part not the most reputable so you have to know where to bet. Changes in UK Gambling Regulations and taxation rules (specifically point of consumption laws) have resulted in the closure of a number of bookmakers to UK customers. This is a blow for matched betting and advatange players, but is there a way around these rules? BitCoin is potentially the answer, as one of the main selling points of the currency is it's annonymity of it's use (why else did it become the Silk Road currency of choice before the drug exchange site was shut down!). In the future it should be possible to make deposits to sites via BitCoin that will allow you to keep your country of origin a secret, and thus work around the UK rules. At the moment most of the established players aren't accepting BitCoin anyway, but there are a couple of new comers to the market that are building up fairly solid reputations and also offering sign up bonuses. That means there's money to be made from BitCoin betting. 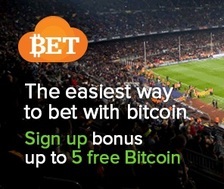 Sign up to Cloud Bet and bet with your BitCoin, enjoying a 100% first deposit match. They offer the normal selection of sports, pretty good odds and casino games as well for when you can't get enough juice from your sports bets. Along with CloudBet they are probably the only two recommended BitCoin sports betting sites on the web. Like CloudBet, Nitrogen also offer casino games. BitCoin betting may be a new way of doing things, but it looks like the future is bright and that it might be a great way of betting without being subject to local issues and governance. With that comes the risk that you are left without a strong regulator if things go wrong, but given the way the UK Gambling Commission has dealt with BetButler, Bodugi and Canbet you might not even notice a difference. As ever, only bet with money you can afford to lose and you should be alright overall.